Many bountiful welcomes to you all, delightful readers. Why so jovial, you ask? I’ve been spending a week or so getting my Nurgle on the go. I’ve been churning through painting the Nurgle half of the Dark Imperium Box Set. You are likely more than aware of this box by now and if not you can find all the information you need in our post here. I figured it was about time you saw how things were fairing with the new box and so will be showing you exactly how good the contents are. Specifically from the Nurgle side here. I actually took some time off painting to build anticipation for these new models. They were exciting to see for the first time and I can say that painting them thus far as been immensely enjoyable. I’ll enclose some images below so you can see how its all going. Just in case you’re in doubt or are on the fence about the quality of the models or are somehow unaware of them. First, the bread and butter of the army – Poxwalkers! 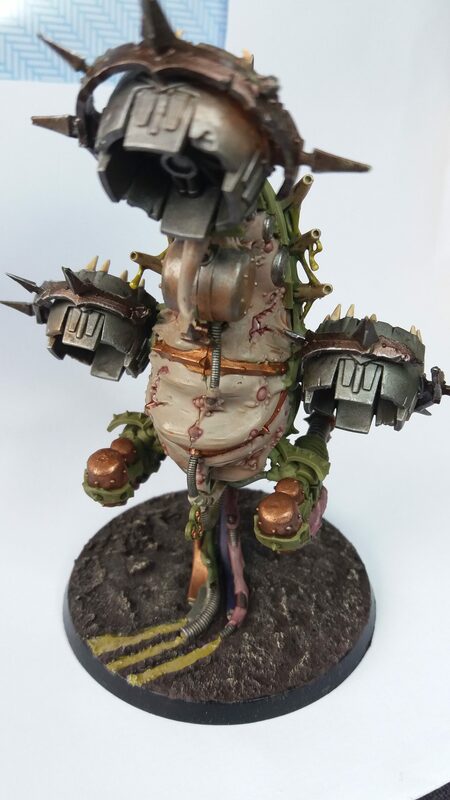 Poxwalkers are grotesquely infected and mutated members of the Imperium whom have fallen victim to one or many of Nurgle’s great gifts. They are effectively walking zombies who cling to fragments of their past lives to be used as brutal bashing or slashing instruments. These guys are a delight to paint and can be done very, very quickly. I managed to paint two each day at the least using the method of spraying white and getting the skin tone in using any appropriate wash of my choosing. This is possibly the best method to get a lot of these guys done quickly with decent results. Following this you are able to get them done swiftly by simply adding a few details afterwards (belts, boots, weapons, etc). You can even use a medium to thin down the washes to get different tones out of the same washes across numerous models. Next, we move on to the biggest body of the box – the Foetid Bloat Drone. 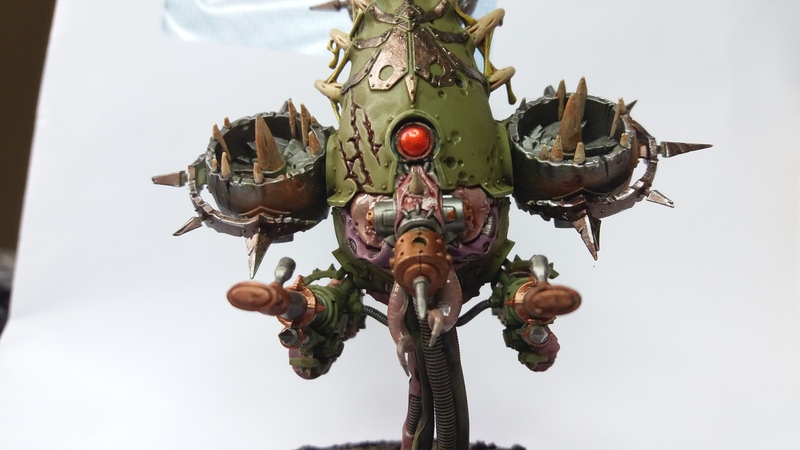 This thing, not a million miles away from the original Blight Drone from Forgeworld, is a flying sack of puss eager to share its content with anything in its way. It even boasts a delightful “plague probe” to share the disgusting gifts in a more intimate style via close combat. The model itself, being rather large compared to the others, has a vast number of small details that really help to make it stand out. Loose cables/tubing, cracks and claw marks in the armour, grotesque and pock-marked flesh. It is a sight to behold and I look forward to having it dart across the table dispensing all that it can upon my foes. 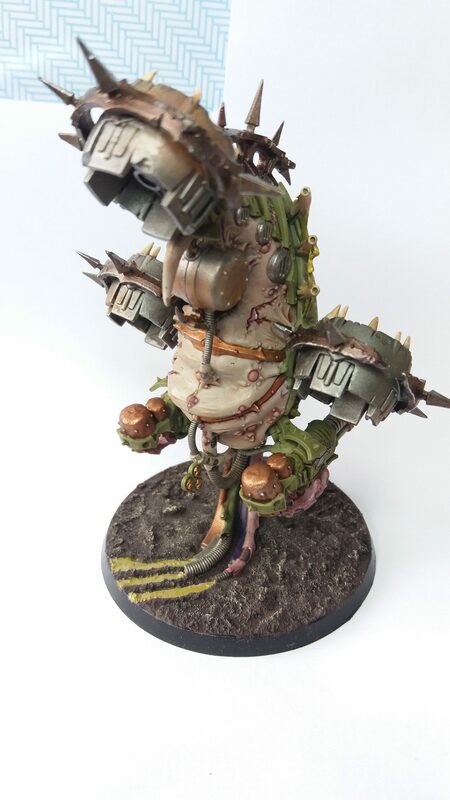 It took some time to get this to a state I was happy with but I certainly feel the model itself is a wonderful exhibition of what makes Death Guard so visually striking. Check back later as I bring you more on the Death Guard models from the Dark Imperium along with some battle reports and other tidbits of information. As always, if you enjoy our content you can donate to our Patreon or simply follow us on Facebook to keep up to date.